It is not too early to start thinking of June! 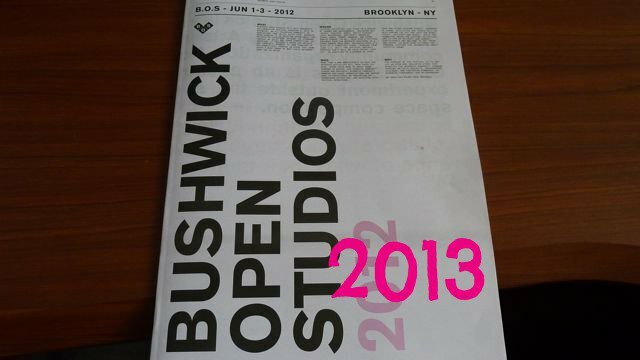 Especially if you want to make the most out of your Bushwick Open Studios 2013 experience as a volunteer, venue or artist. On Monday, January 28 at Bat Haus, 7-9PM, the organization responsible for BOS, Arts in Bushwick is holding their first public meeting. As you know, Arts in Bushwick is an all-volunteer organization without a hierarchical structure. Therefore, regular involvement of the Bushwick community is crucial for its existence. Arts in Bushwick is looking for some key volunteers, such as web and map designers, a Wordpress coder, event coordinators and other organizers. You will have a great opportunity to chat with Lucia Rollow, Julia Sinelnikova and other key figures of the last year's festival. Further reading: Check out our BOS 2012 coverage.